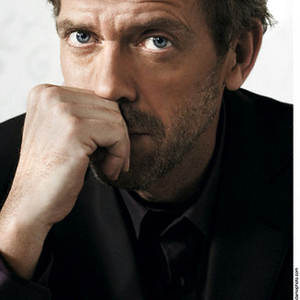 Hugh Laurie is an English actor and comedian. Originally part of Cambridge University Footlights, he found fame playing various roles in the classic British comedy TV series "Blackadder." He is perhaps more famous for the legendary TV sketch show "A Bit of Fry and Laurie" where he performed with his Cambridge University chum, Stephen Fry. Since then he has appeared in various films (Maybe Baby, Girl from Rio, Flight of the Phoenix, Stuart Little), television work and done some theatre work in London's West End. Mr. Laurie was rumored to be a top contender for the role of "Doctor Who," (prior to David Tennant getting the part), however he was cast, and currently stars as, Dr. Gregory House in the hit FOX Medical/Drama TV show "House, MD". Songfacts reports thar Laurie is also an enthusiastic and keen musician, playing the piano, guitar, drums, harmonica and saxophone. He has displayed his musical talents on several episodes of House, as well as on previous shows he starred in such as A Bit Of Fry & Laurie. In 2010 Laurie played piano as a special guest on Meatloaf 's track If I Can't Have You. He has written one novel "The Gun Seller," and another one "The Paper Soldier," is tentatively scheduled for September 2009. Mr. Laurie has some musical talent, notably the piano and mouth trumpet (he can make convincing trumpet sounds using just his mouth). He played '20s numbers on the piano in the TV series "Jeeves and Wooster" (again with Stephen Fry) in addition to some original comic songs in "A Bit of Fry and Laurie." He is currently a member of "Band From TV" with several other TV personalities. He is married with children, although he has become somewhat of an absentee father due to his work on American television while his family stays in London.